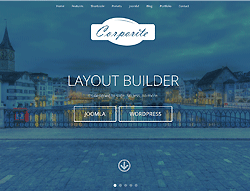 Corporite is a latest multi-purpose professional template for Joomla3!. Its comes with clean, white and professional design. It is suitable for portfolio website, creative agencies and corporate businesses. Its help you to create a stunning and slick creative, business or corporate website. This template comes with Powerful Bootstrap, Helix II framework, Font Awesome, K2, Nice Portfolio, Fullwidth OnScreen Slider, Ajax Contact, CSS3 Animations and more features. Use Helix II framework to manage the styling and colors of your site in fast way.